Once a quiet fishing village, the quaint little town of Ferragudo is characterised by fishermen’s cottages, whitewashed buildings, and narrow cobbled streets. 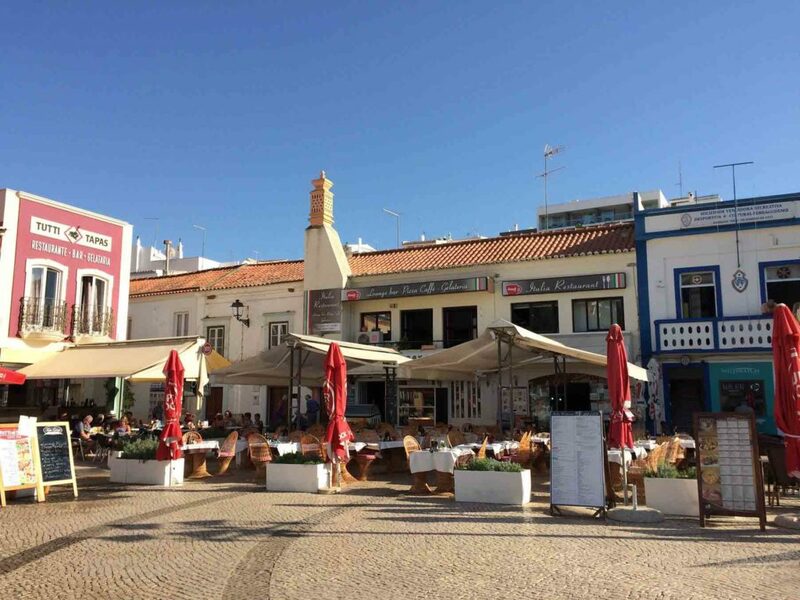 It’s one of the prettiest towns on the Algarve and, although the town’s focus is now tourism rather than fishing, Ferragudo has been fairly unaffected by the worst parts of tourism: you won’t find any neon or high-rise hotels here. Life congregates around the town square, Praça Rainha Dona Leonor, which is surrounded by cafés, restaurants, and an ice-cream parlour. There’s always a friendly and relaxed vibe here as holidaymakers dine in the square’s restaurants, local residents sit and chat on the benches surrounding the square, and children play together in the middle of it all. Fishing is still a big part of Ferragudo’s culture, and is constantly happening in the background. Walk down to the harbour and you can watch the fishermen as they moor up with that day’s catch. If you’re staying in self-catering accommodation, you can do as the chefs and restaurants owners do and buy directly from them. If you don’t fancy cooking, don’t worry: Ferragudo has plenty of great restaurants. Despite it being quite a small town, there are enough restaurants that you could visit a different one every night of a two-week stay. Hiring a car gives you a lot more freedom to explore the towns and beaches surrounding Ferragudo, but you can get by without it. Praia Pintadinho and Praia Grande are both within walking distance of the town centre. 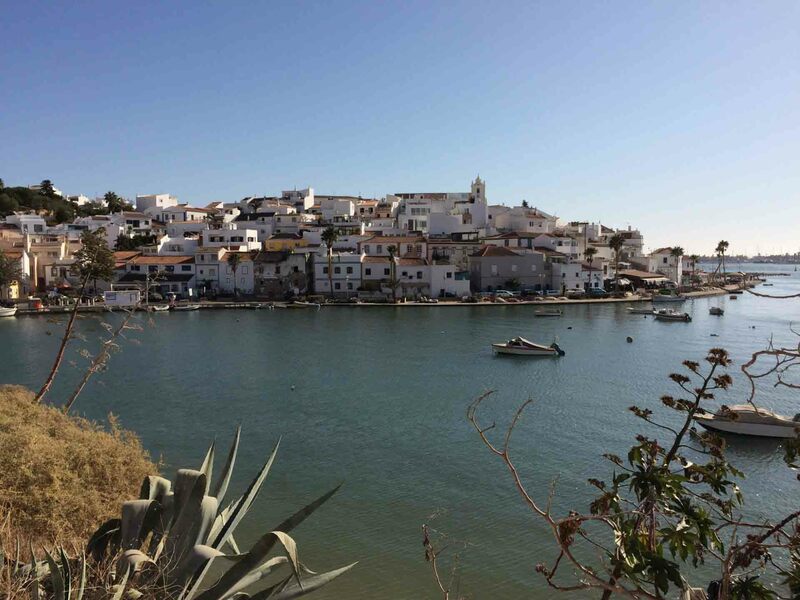 You can also take a ferry for a day-trip Praia da Rocha, take a boat trip up the Arade River to Silves, a boat trip to explore the caves at Benagil, or go dolphin watching. Having a car does give you a lot more freedom to explore. There are plenty of great beaches that are within a short drive of Ferragudo like Praia dos Caneiros, which is just over 1 km away. Attractions like Slide & Splash and nearby towns like Carvoreiro and Lagos are all on Ferragudo’s doorstep, but require a car or bus to get to them. Ferragudo is situated left of the centre of the Algarve, in what’s known as the Western Algarve. Faro Airport, the Algarve’s airport, is located around 67km away: 50 minutes on the A-22 toll road or 70 minutes on the N125. It is within a short drive of several popular waterparks like Slide & Splash (10 km), Aqualand (16km), and Zoomarine (21km). For nature lovers and walkers, the rugged Western Coast of the Algarve is just an hour by car. Accommodation in Ferragudo tends to be villas, apartments, and small hotels: you won’t find any big hotels or high rise apartment blocks here . Villa Encosta da Praia (Guesthouse) – Situated just 4 minutes from the beach, this modern guesthouse offers stylish yet rustic accommodation with a swimming pool, hammocks, and free Wi-Fi. Espaco and Sol (apartment) – Simple accommodation that’s ideal for families or those visiting Ferragudo on a budget. Facilities include free Wi-Fi, a BBQ, and a terrace. One2Seven (aparthotel) – Features rooms, contemporary apartments, and guesthouses with views that overlook Ferragudo and the Arade River. Onsite facilities include a gym, infinity swimming pool, and lounge terraces. Vitor’s Village (aparthotel) – A holiday village with rooms and apartments, Vitor’s Village features a swimming pool, restaurant, and complimentary bus service that takes you to the nearby beaches. Casa Coqueiro (Villa) – Situated 5 km outside of Ferragudo, this 4-bedroom villa features an outdoor swimming pool as well as a large kitchen and dining room for entertaining. Free Wi-Fi is available throughout. Boat trip to Silves – A 4 hour scenic boat trip up the River Arade to the medieval town of Silves. Boat tours – As well as the river trip to Silves, several other boat trips leave from Ferragudo to explore the nearby caves or to go dolphin watching. Waterparks – Some of the Algarve’s most popular waterparks, including Aqualand, Slide & Splash, and Zoomarine, are all a short distance from Ferragudo. Ferragudo Flea Market – Takes place on the 2nd Sunday of every month. (As well as this flea market, there are plenty of other markets happening every day all over the Algarve). Festa da Nossa Senhora da Conceição – Taking place every year in August, this religious procession which celebrates Ferragudo’s parton saint makes its way through the streets of Ferragudo and onto the fishing boats. Note: While very few big events take place in Ferragudo itself, there’s usually something happening within a short drive of Ferragudo.